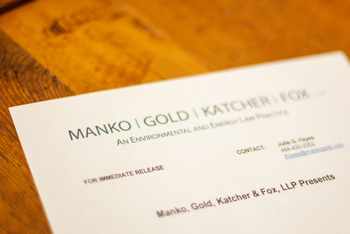 Manko, Gold, Katcher & Fox, LLP, the environmental, energy and land use law firm based in the Philadelphia region, congratulates its partners Carol F. McCabe, Nicole R. Moshang and Shoshana (Suzanne Ilene) Schiller for being included in the Top 50: 2018 Women Pennsylvania Super Lawyers listing. Manko Gold was the only firm with three partners included on this Top 50 list. McCabe was also one of only 16 women included in the Top 100: 2018 Philadelphia Super Lawyers Top List . Additionally, more than 85 percent of the MGKF attorneys have been included in the 2018 Super Lawyers* list published by Thomson Reuters. In total, 17 partners are listed in Pennsylvania Super Lawyers, including Joseph M. Manko, Marc E. Gold, Bruce S. Katcher, Robert D. Fox, Rodd W. Bender, Bart E. Cassidy, Brenda Hustis Gotanda, Jill Hyman Kaplan, Carol F. McCabe, Michael M. Meloy, Jonathan E. Rinde, Jonathan H. Spergel, and Katherine L. Vaccaro for environmental law and Neil S. Witkes, John F. Gullace, Nicole R. Moshang, and Suzanne Ilene Schiller for environmental litigation. Partner Kathleen Campbell, Stephen D. Daly, Thomas M. Duncan, Diana A. Silva and Garrett D. Trego are included in the 2018 Pennsylvania Rising Stars list for environmental litigation while Michael Dillon, Partner Bryan Franey, Zachary Koslap and James M. McClammer are listed for environmental law. Thomson Reuters defines “Rising Stars” as up and coming attorneys 40 years old or younger, or who have been practicing 10 years or less.